Like the new baby mobile? 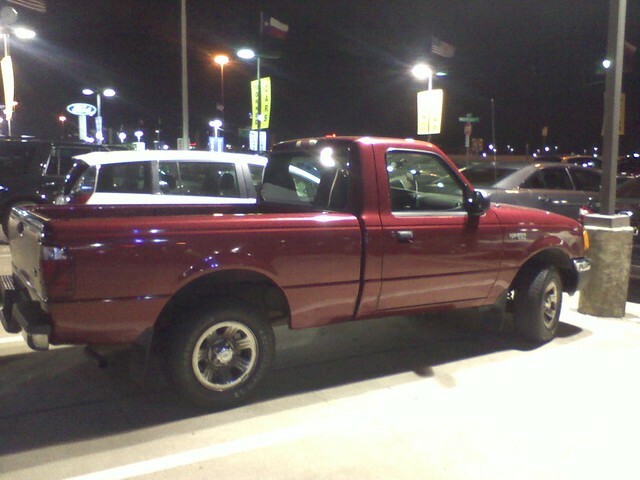 We had to say goodbye to my Ford Ranger since you aren’t allowed to drive with a baby in a two-seater truck. Plus, at 12 years old and 154K miles she was definitely in need of some repairs. 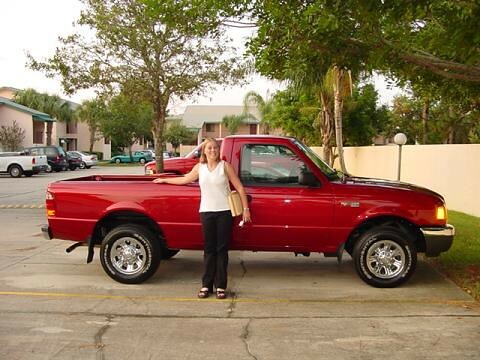 I think this was taken the day we got the truck back in October 2002 when we were living in Melbourne, Florida. Ah, I was skinny! And not swollen! And the truck was shiny and new! It was a little bittersweet turning over the the truck I’d driven all of these years, especially since I was giving up a stick shift. I’ve driven a stick since I was 15! 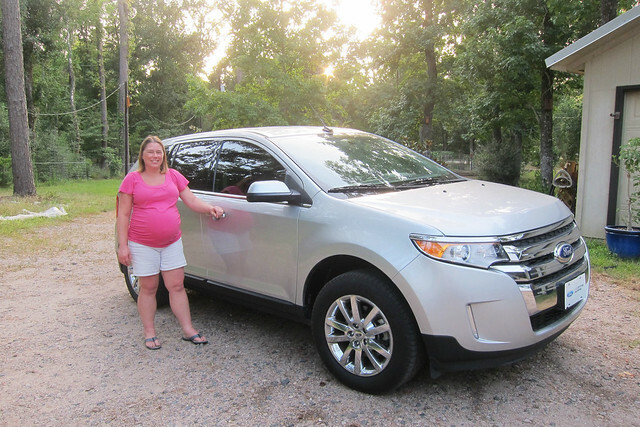 Anyway, we found a good deal on a certified pre-owned Ford Edge and brought it home a week ago. So far I love it! But yeah, looking up there at the first photo, I’m so swollen. My legs…oh my legs. My feet hurt. I gained 4lbs in the week between my appointments and my midwife jokingly asked me if I’d been eating packs of Oreos. Oh, I wish! No, I’m fairly certain it’s all of the water retention I’ve got going on. Don’t worry, my blood pressure is fine, urine samples are coming back fine, and I’m not seeing spots or having intense headaches. It’s just the damn Texas heat. I’m over it. If it weren’t for the water retention I think I’d be pretty happy with being pregnant still. However, since I am dealing with it I’m also over being pregnant at the moment. With my sights on the home stretch, we’re looking at 10 days until my ‘due date’, I’m just ready to be done. The folks at my office have a list of guestimates on due dates and the baby’s weight with the first person’s guess on when the baby will come being tomorrow. Chris’ guess was this coming Monday. I was originally still holding out for September, I really wanted a September baby, but dude, now tomorrow sounds good, too. Speaking of the baby’s weight, I didn’t mention that at my 36 week appointment I had another ultrasound. It was one for judging the approximate size of the baby and even though those ultrasounds at this stage in the game aren’t all that accurate, it came back that he was in the 90-something percentile for growth and was estimated at 7lbs 5oz. Yeah….a big dude potentially. In general I’ve always felt he was long, but have never felt he was too large or anything. So, we’re doing another ultrasound next week to see what has changed. I’m not getting hung up on it all, I think he’ll be on the big side but I’m not worried (ok, not too much!). That said, if he wants to come out a week early and finish growing on the outside, I’m totally down with that. Mentally I’m trying to get used to the idea that we’ll soon be toting around a baby. I feel a bit bad for Leo having his life upturned in the last month with Samson dying and Leo not really knowing why his brother isn’t around anymore, and then knowing he’ll be bombarbed with guests and then some strange, crying thing invading his life soon. I’m mostly nervous about breastfeeding and being successful with it. I had a lot more to write but now the words won’t come, so I’ll just leave it at that and start a new post in a few days. Postpartum Realities from Baby Rabies. Playing House, Dressing Up, #likeaboy from Mommy Shorts. I’ve been thinking a lot about how we’ve come a long way in promoting to girls that they can do things just like boys do but we’re lacking in balancing that on the other side of the spectrum, instead telling boys that some things are too ‘girly’ for them to do. Just pondering a lot of gender related items, that’s all. How I imagined it to be from Ann-Marie Loves…can’t wait to have my own set of photos like these. Sausage legs! I don’t think so! Just a little swollen. Yep I said Monday too. New moon! I it may take Leo a few days to get used to Teddy but he already knows he’s there. Just like Biff knew when Steph was preg with all the kids. He will love him.